Cricket has been played at Castleknock for over 150 years. 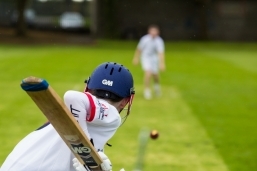 Cricket practices occur all the year round on Tuesday afternoons in the sports hall from 3.45pm until 5pm with cricket coach Mr Willie Barr. The cricket season is a short one. There are competitions for U13s, U14s, junior and senior. Cricket practices for senior players take place over the last nine w eeks of the school year on Thursday afternoons. The College cricket facilities include a permanent artificial crease, a cricket net, one cricket pitch in front of the pavilion and a cricket bowling machine in the sports hall. Castleknock College maintains some of the long standing traditions that go with cricket; we wear whites at matches, we provide good teas (all players must bring buns sandwiches or cakes to home matches) and, of course, courtesy, respect for the opposition and for umpires, and good manners are maintained at all times. The College cricket coaches are Mr Brían O’Rourke (Leinster Development Manager) and Mr Willie Barr. Cricket training continues on Tuesday for all years. 1st Year internal class leagues will start in one week and it is very important that students come to training to make themselves available for selection. Training at 4:00pm on Tuesday. Cricket leagues being on 01 April. Training continues Tuesdays at 3:50pm and Fridays 7:50am. Teams will be picked based on who attends training sessions. 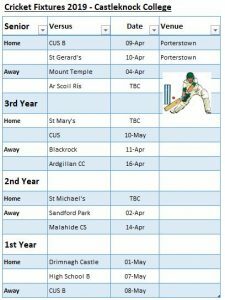 Fixtures list is set out below.